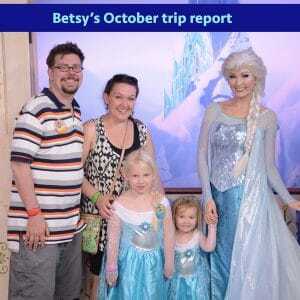 Betsy and her family just returned from an October trip that included lots of different character experiences, a dessert party, renting DVC points and more. Hear from her before and after her trip in this episode. 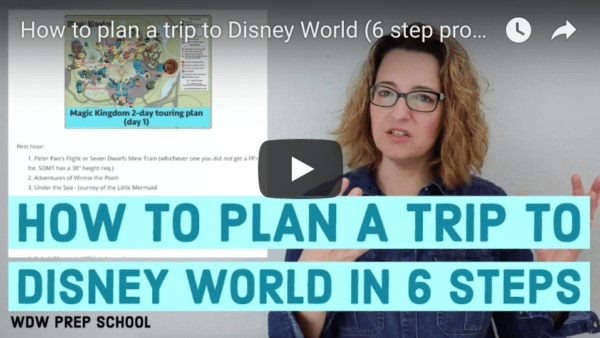 I also have a quick tip on how to "FastPass" the food line. While articles on this site are updated frequently as changes occur, podcast audio and show notes are not. The text below is show notes from this episode. There's much more info included in the audio so be sure to listen to the episode for a better explanation. Want to be considered for a first-timer trip report? Please leave me a SpeakPipe message with your name, trip dates, resort, and who is in your group. "During our time in Magic Kingdom we decided to stop and get a Dole Whip on our way through Adventureland. Apparently everyone else had the same idea...I’ve never seen a line at Aloha Isle with more than a couple people and there were about 20. So we stood in line for a couple minutes and it wasn’t moving at all. So instead we got out of the line, opened the My Experience app and ordered our Dole Whip using Mobile Ordering. Approximately 30 seconds after placing the order I was able to walk right up to the window for pickup. Saved us time, and saved us standing in a line! We did this a couple of times when we stopped spontaneously for something at a Quick Service location. I know this doesn’t work right now if you’re on a meal plan, but if you aren’t - save yourself from an unnecessary line!"